← Break Out The Vodka!! “ President Trump proved not only unable, but unwilling to stand up to Putin. He and Putin seemed to be speaking from the same script as the president made a conscious choice to defend a tyrant against the fair questions of a free press, and to grant Putin an uncontested platform to spew propaganda and lies to the world. Bravo John McCain! Country before party. My hearts breaks for the land of my birth. Thank you for posting this. I have not seen it in the Australian media. Leggy – It was just released about an hour ago or so here. Spread it around your expat friends in Australia. Don’t give up hopes. Regards from hot humid Florida. Hoping the mid-term elections bring some promise for the future. A true hero. I posted on FB. The world needs to see this. Indeed. I have NEVER had more respect for Senator McCain than I have today. Thank you for this very important post. The United States is in a very real crisis. He can’t be serious. Hard-hitting, candid, and necessary words by McCain, but this concluding line displays the same naiveté as when he chose Sarah Palin as a presidential running mate. McCain seems like a decent human being, but he’s shackled to an indecent political party, and he shifts from conservative to moderate based on the weather. And he’s certainly not “country before party.” If he was, he wouldn’t have vowed, in the run-up to the 2016 election, to block all of Hillary Clinton’s Supreme Court nominations had she been elected. I don’t particularly care for John McCain. He has been a GOP stalwart over his career. Every once in a while however when the stakes are high he does the right thing. His vote if I recall saved Obamacare. And he has spoken out today loud and clear. I will give him credit for that. He has a vision of America not in sync with mine but I never doubted he loves his country. He showed it today. I would love to see him show up at the Senate and say it to their faces. I’d love it, too, but it’s too late. Americans, including McCain, had ample opportunity to prevent a catastrophe like Trump occurring. McCain endorsed Trump. He only pulled support after Trump’s “Access Hollywood” scandal broke. And like every other GOP officeholder, he refused to endorse Clinton, although she was the only alternative to this monster. He did not vote for Obamacare. On the contrary, he strongly opposed it, and even vowed Republicans would no longer work with Democrats (“They have poisoned the well…”). Talk about obstructionism in Washington. After Trump took office, he pushed to replace ACA. Does he “love his country”? Sure! What U.S. political officeholder doesn’t! But he’s also a conservative Republican who puts his party before country most of the time, and pays literal lip service (like above) to country before party only when convenient. I always smile at the short memories so many Americans have. 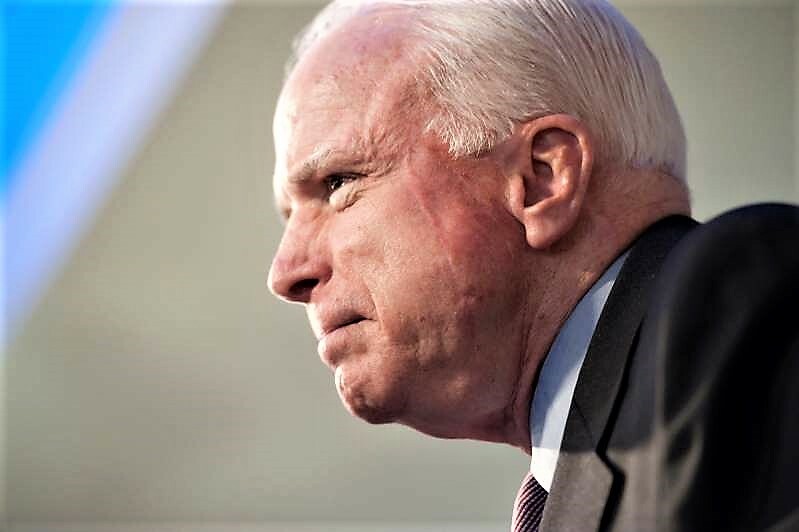 You’re smarter than most, and I’m amazed how quickly you are to now lionize McCain. Compared to Trump, he’s an angel. Then again, so is Bush. I suspect that President Trump’s sacred responsibility is President Trump. Speaking as a ‘Foe’, (I love being a foe) I see McCain’s speech as very statesmanlike of course. But a McCain/Palin combo would have been no more appealing to me personally than the current Trump/Pence fiasco. There is something brutally honest about Trump’s inability to tackle the job. We can see the stupidity of the man, instead of having that hidden from view, as in the past. In a strange sort of way, I actually prefer that. Best wishes from your foe, Pete. Greenpete – John McCain voted “no” on the last Obamacare repeal effort – his was the critical vote that saved it. Regards. Ok, egg in my face, and I apologize. He did cast a vote, along with Murkowski and Collins, to save Obamacare (thanks for setting me straight). I was thinking of his earlier, steadfast opposition while Obama was in office. The man does have a little backbone, compared to the majority of that party. And like you, his vision for America is not in sync with mine. He’s less a hero to me for his politics than his fight against cancer. Indeed Greenie. I campaigned very hard against McCain / Palin. My Obama sign on my lawn brought out a sea of McCain/Palin signs in my semi-rural Florida community. But I must admit the man stands up now and then against his own party, now filled with demi-fascists. And his struggle against his cancer is a mighty effort indeed. Love to see him show up in the Senate and vote against the Emperor’s Supreme Court nominee. Best regards.